Upon their thunderous debut, planeswalkers dazzled gamers everywhere with their reusable and fearsome abilities. 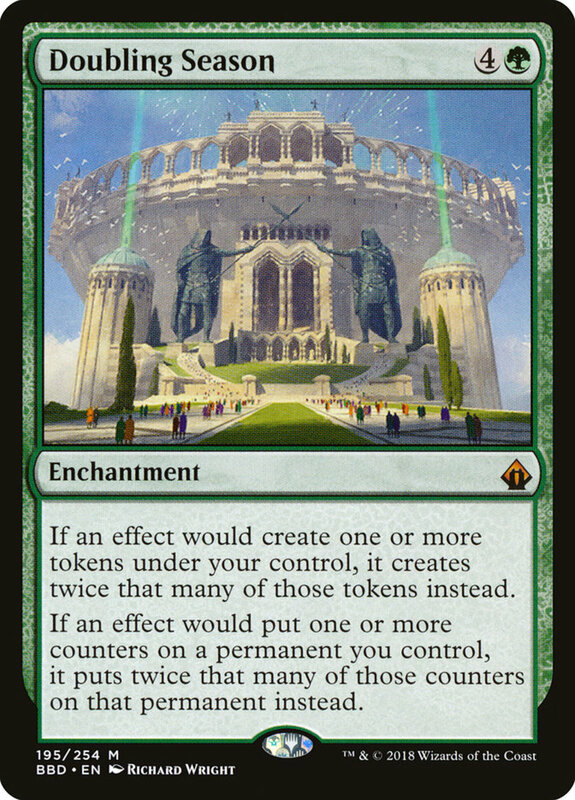 Like other Magic: The Gathering cards, each has a Converted Mana Cost (CMC) that must be paid before it can be used. Planeswalkers utilize a unique "loyalty" system where, once per turn, they can activate one of their abilities by adding or subtracting the corresponding amount of loyalty counters. Many rookies immediately look at the planewalkers' strongest "ultimate" effects, but in reality the day-to-day, er, turn-to-turn abilities matter more because you'll be triggering them far more often. With dozens of cards to pick from, let's take a look at the ten overall fiercest planeswalkers in Magic! Note that I picked at least one unit from each singular color (including colorless) to help ensure you'll find a useful troop here no matter your deck preferences. Also, no double-sided creature/planeswalker cards appear, which we'll save for another list. Finally, I admittedly lean towards EDH over standard play, and please remember this list debuted before several later expansions (like the Dominaria set). On with the countdown! 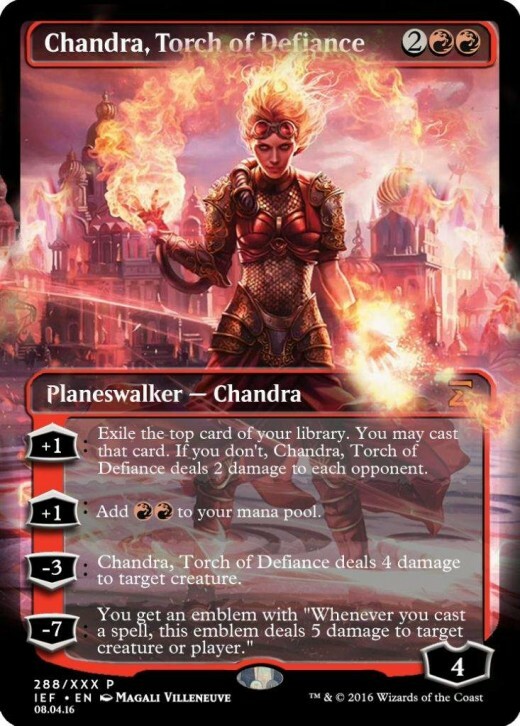 The mono-red planeswalkers often strike me as lacking, but one of Chandra's several renditions bucks the trend. The symbols in the upper right indicate her mana cost, totaling four here, and the bottom right shows the amount of loyalty counters she'll arrive with, again four. Chandra enjoys access to two +1 abilities. One lets you cast a card from the top of your deck, basically serving as a free draw, and the other provides mana equivalent to what two mountain lands, could produce, a nice benefit considering red's general lack of ramp. Chandra's -3 simply deals damage to a creature, and her ultimate -7 gives a permanent emblem (see below) that damages a monster or player whenever you cast a spell. Both are nice, but the +1 abilities here are the real prize. Unlike so-called "permanent" cards (creatures, lands, artifacts, etc. ), emblems can never be removed from play since they cannot be returned to hand, destroyed, or exiled. Pay particular attention to planeswalkers who offer these impressive and irremovable upgrades; once one hits the field, you can often call the match. 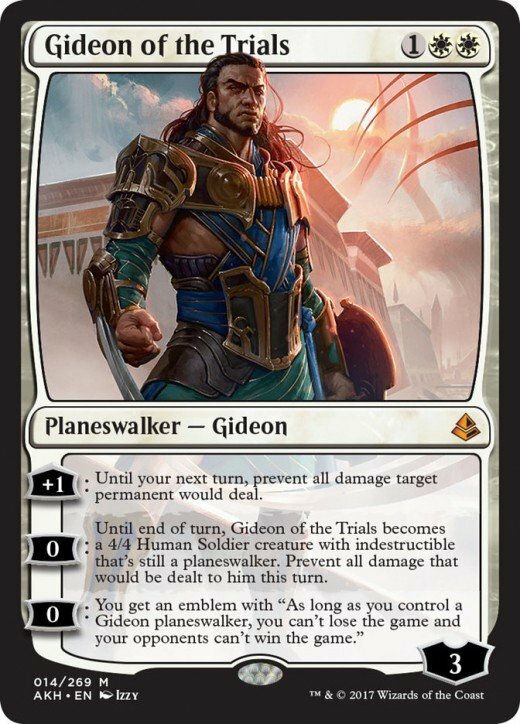 Like Chandra, Gideon has suffered several forms that never quite appealed to me, but this edition finally hit its mark. Costing only three mana, Gideon arrives with three loyalty counters and three abilities, none of which decrease his loyalty! The +1 effect prevents a target from dealing damage for a turn, and the first 0 ability turns Gideon into an indestructible creature for the turn, bearing 4 power and 4 toughness. However, his second 0 effect presents his true allure: you'll gain an emblem that prevents you from losing as long as you control a Gideon planeswalker! This can save you repeatedly from dire situations, and even if Gideon eventually falls, if you can cast another (in any of his forms), the emblem's power will again emerge. +1 loyalty lets you search your library (deck) for a swamp land card, ensuring you always have a land to play for the turn. 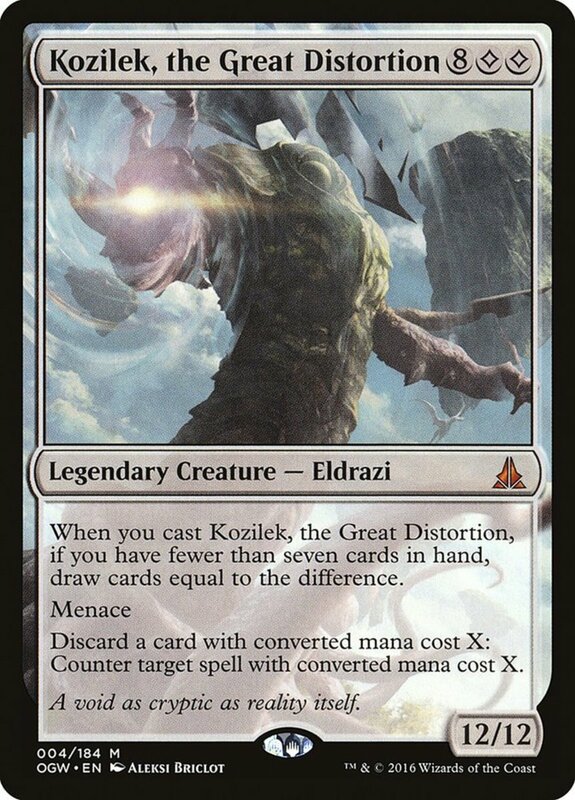 -3 weakens a creature by -1/-1 for each swamp you control; this is a superb way to eliminate indestructible creatures, as they still die if their toughness score ever hits zero. -6 gives you an emblem allowing your swamps to tap for four black mana (instead of one) each turn! This ensures early access of your most costly (and powerful) spells. 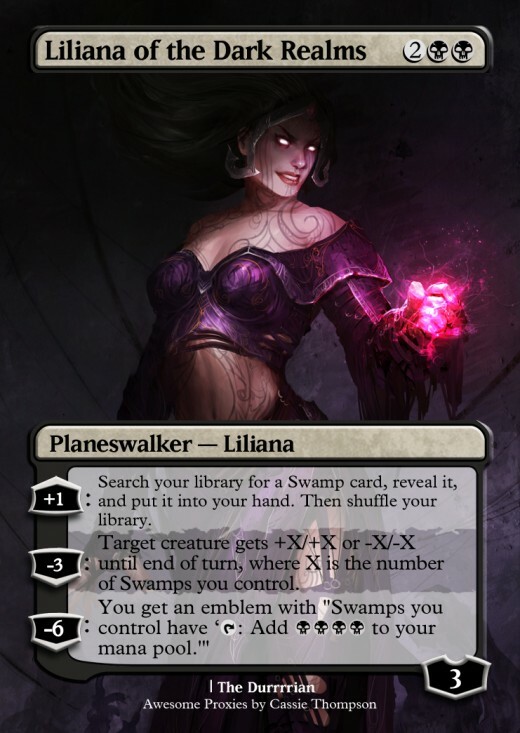 Three great traits at low expense makes Liliana a no-brainer for most of my monoblack decks, especially since she's pretty cheap for a planeswalker, costing well under twenty dollars (as opposed to some $50+ troops). +1 reveals the top card of your deck and deals damage to all opponents equal to its CMC. This adds loyalty to Sorin, gains you a card, and potentially injures all rivals! 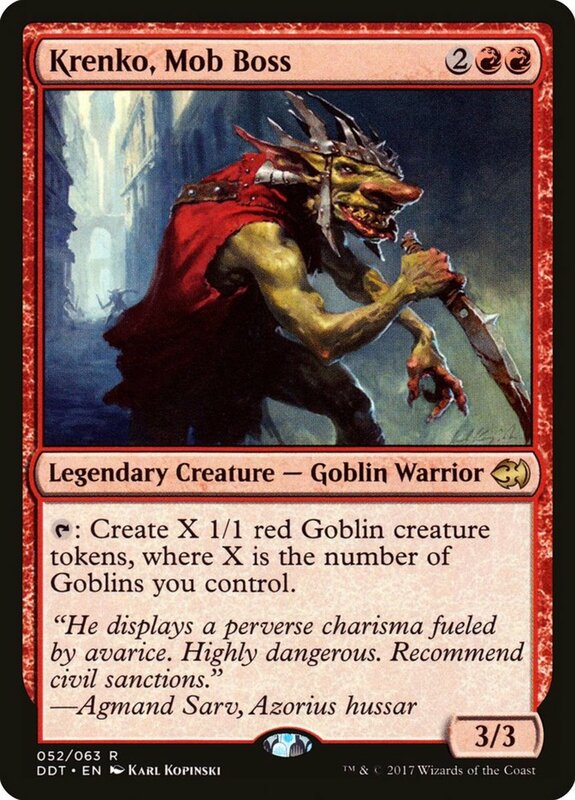 -X subtracts loyalty at a value of your choice to deal a corresponding amount of damage to a creature or planeswalker and gain as much life. A nice effect for its variability, option to target planeswalkers, and life gain. -9 adds a ton of weak bat creatures to your field. More specifically, you'll get as many as the highest life total among players. The bats are only 1/1, but their lifelink quality regains health when they battle. 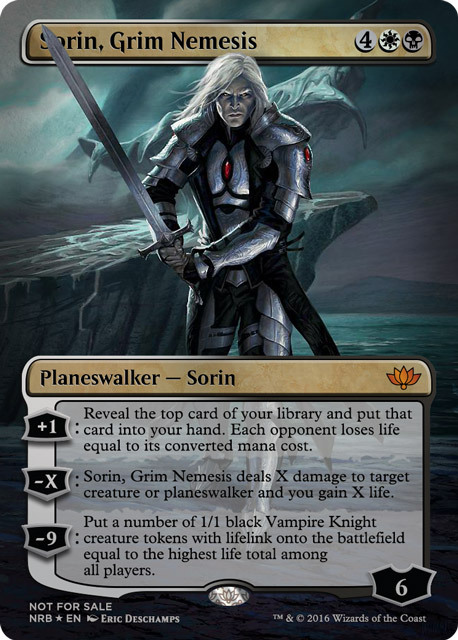 Sorin's awesome +1 effect and his potential to target planeswalkers with -X (which few cards can do) warrant his usage in a plethora of builds. Another twin-colored card, Kiora requires only four mana, needing at least one blue and one green. Her loyalty begins at four, and she wields a superb +1 ability that untaps both a land and a creature! This turns her into nimble mana engine not to be overlooked. -2 reveals four cards from the top of your deck and lets you add one land and one creature to your hand, a great way to refresh your options.-8 allows you to have any creature entering the field under your control fight an opposing creature, then summons three enormous 8/8 octopus tokens to the field. In short, all of Kiora's traits impress, especially tempts her low cost and fantastic +1. +2 exiles cards from an opponent's library until a non-land is exiled. You may cast that card for free this turn! +1 forces opponents to choose and exile two cards from their hands. -4 simply deals seven damage to an opponent or creature. -12 exiles all nonland permanents of all other players! 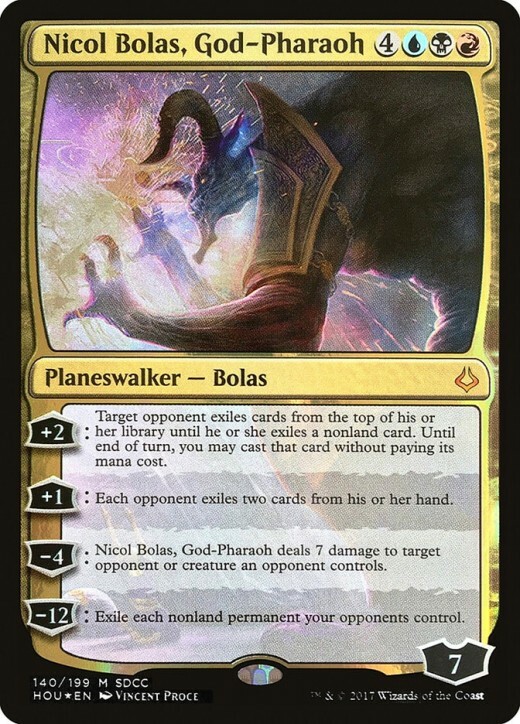 Because Nicol arrives with so much loyalty and can add two more each turn, triggering his ultimate requires far less time than other planeswalkers. Additionally, both his + abilities offer great effects while adding to his loyalty, alone justifying his inclusion. 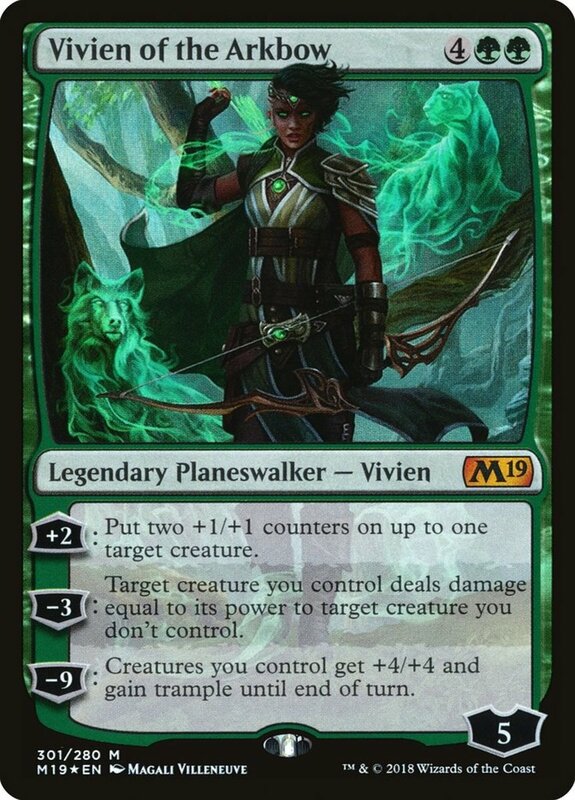 Though she joins the fray (no pun intended) with only three loyalty, Frey here possesses everything I want in a green planeswalker. Her +2 adds an elf token (whose subtype adeptly combos with elf-focused green decks) that can block attacks or tap for mana, her -2 provides an awesome artifact/enchantment removal, and -6 adds cards to your hand for each green monster you control, perfect for green's creature-centered approach. 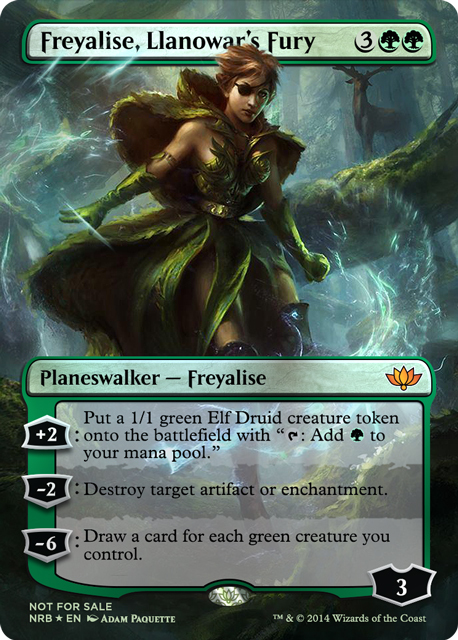 Freyalise's ultimate may be less flashy than others, but it;s more affordable, and her first two abilities wonderfully ramp and remove obstacles Check out her prowess in a custom green Omnath Commander build! +1 scries one card (you peak at the top card of your deck and move it to the bottom if desired), then lets you draw one. -2 returns a creature to its owner's hand. -8 activates an emblem that counters the first spell an opponent casts each turn! 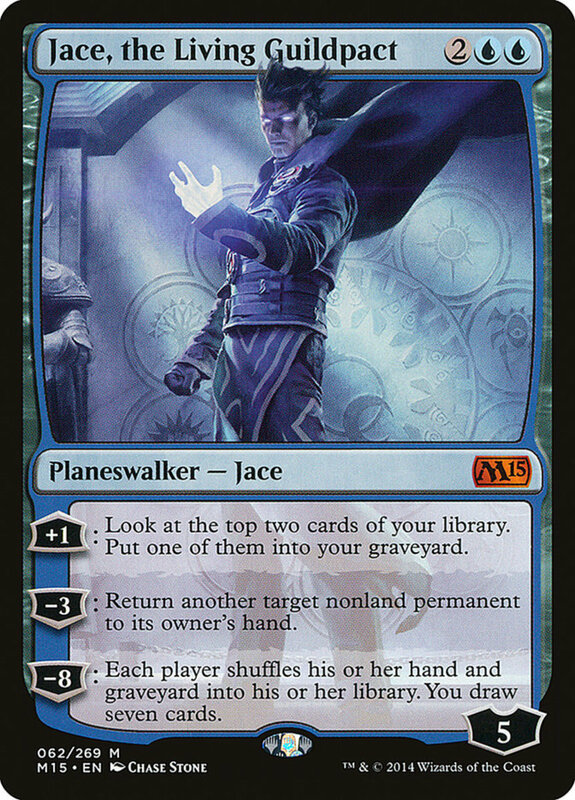 Despite requiring slightly more mana than his upcoming form, this Jace offers excellent boons. His +1 effect not only draws but scrys beforehand, he packs a useful monster removal, and his ultimate -8 almost always signifies game over. Very few decks will recover from having their first card negated every turn; use the "Doubling Season" enchantment to land it on his first turn! 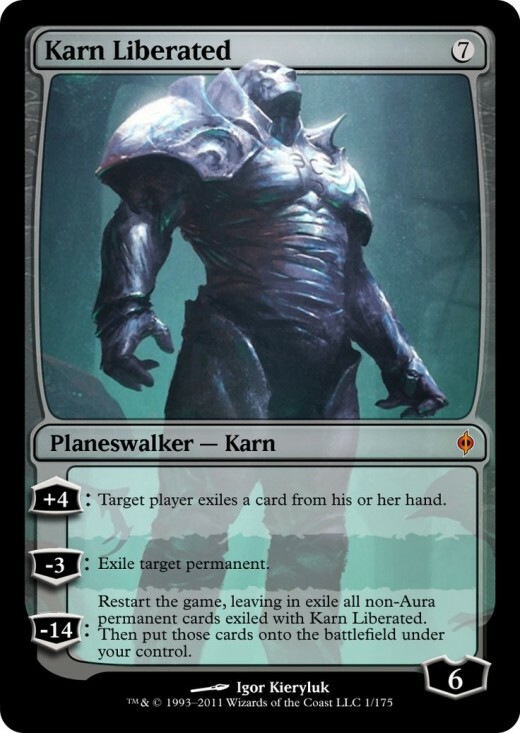 A rare colorless planeswalker, Karn qualifies for any deck but demands seven mana to play. Luckily, he compensates with a trio of fierce effects, and check out how much loyalty he can add in a single turn! +4 makes an opponent exile from their hand. -3 exiles a permanent of your choice. -14 restarts the entire game, but you get to use non-aura permanents Karn has exiled! What else can I say? Both of Karn's first two abilities set up for his -14, he can add a whopping four loyalty per turn, and his ultimate will almost always give you the win by starting a new game with a massive advantage. 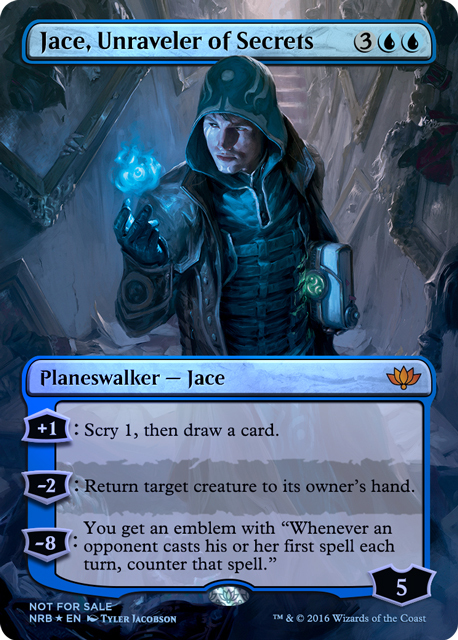 Blue-toned Jace enjoys several great planeswalker cards, this one seizing top spot. +2 functions like a mega scry; you can look at the top card of any player's deck, and place the card on the bottom of the deck if you wish. 0 draws three cards, then sets two from your hand on top of your deck. This can help prepare cards with the miracle trait, which activate incredible powers if played on the turn they're drawn. -1 simply returns a creature to its owner's hand. -12 exiles all cards from an opponent's library, then turns their current hand into their new deck. Potent, but it's challenging to get Jace's loyalty to twelve. 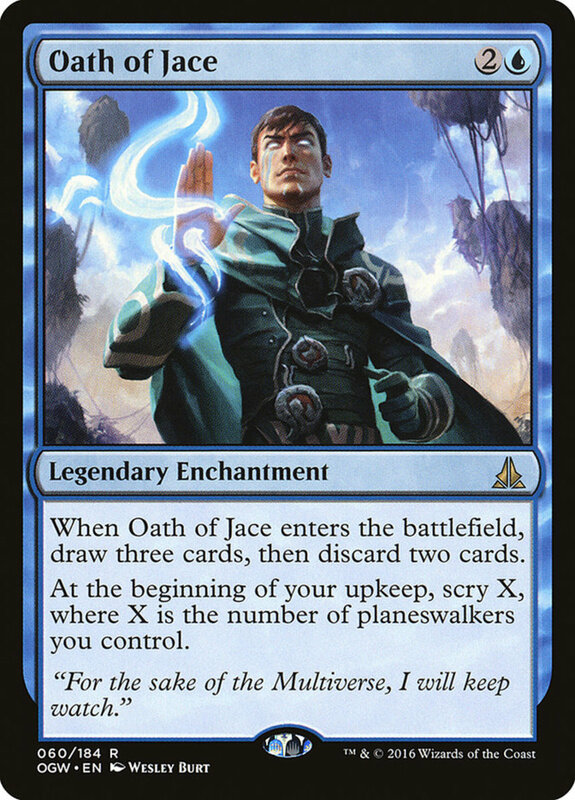 Unlike many of today's planeswalkers, Jace's highlight isn't his + effect or his ultimate, but his 0 and -1. The former cycles through cards quickly and adds to your hand; the latter provides a cheap and resuable creature removal. 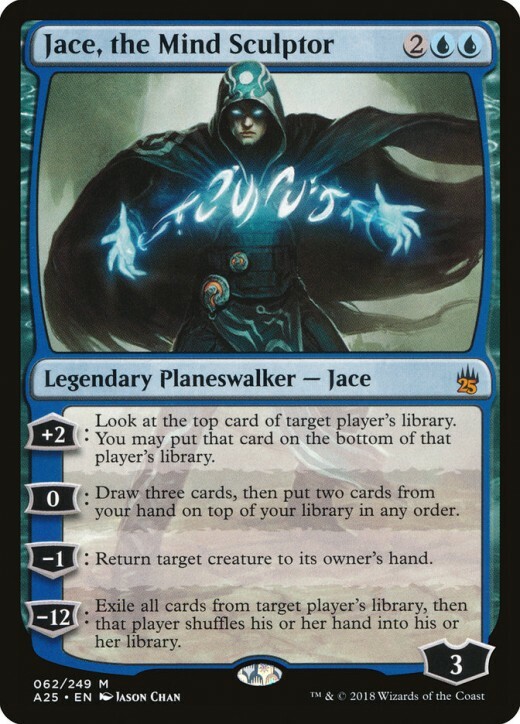 And not many planeswalkers with a CMC of just four offer four different abilities to select from, making Jace a great addition to the card-negating blue team. Now knowing the cream of the planeswalker crop, you can craft your own ideal MTG build, especially if you utilize the several planeswalker support members Wizards of the Coast has produced. But first, vote for your favorite entry, and I'll see you at our next card countdown! Am I correct to assume this list is based on preference, and not competitive viability? Consider it a mix of both. It's also more tailored towards EDH, the format I generally lean towards. In Magic: The Gathering, wouldn't Jace, Mind Sculptor's -12 cause an opponent to run out of cards in their deck and therefore lose the game? The -12 gets them close, but not quite all the way to a deck-out. Remember, after their library is exiled, they shuffle their hand to form a new deck, which usually buys a few turns. And even when a deck runs out, the player doesn't lose until their next draw, so they theoretically have a chance (albeit a small one) for a comeback. Why is Karn, the Planeswalker, not in first? Remember, Karn costs more mana than almost any other planeswalker, a drawback that slightly hinders his still-formidable abilities. Do you think Garruk is any good? I’m trying to build a Magic: The Gathering beast themed deck and I don’t quite know what planeswalkers to include. There are currently six different Garruk planeswalker forms, so please be specific. As a whole, they fall about mid-tier for planeswalkers, though "Caller of Beasts" offers some great ways to field creatures without paying mana costs. Feel free to examine my beast countdown to see some of the best MTG beasts available! Which Magic: The Gathering planeswalker is the strongest in damage terms? Hard to say since many abilities depend on the field state. Angrath, Minotaur Pirate's ultimate destroys all opposing creatures and inflicts damage equal to their power, which often spells game over. Many Chandra ultimates inflict 10 damage to all opponents and opposing creatures. Nicol Bolas can inflict 7 damage while forcing your opponent to discard and sacrifice permanents. What do you think of Nissa Sage Animist for one the top MtG Planeswalkers? 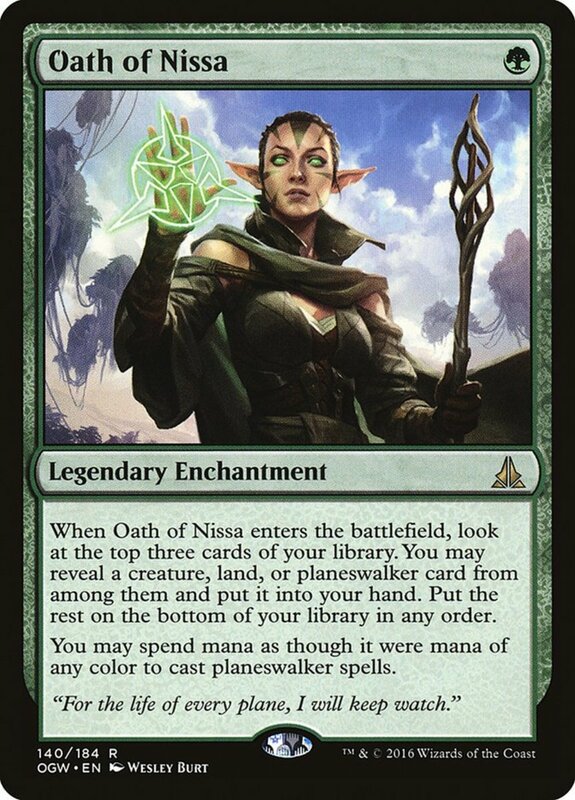 I do very much like Nissa's Animist form, but you're referring to her ultimate ability, which will take time to build for. Even then, lands-to-creatures has never been my favorite mechanic because it exposes your lands to additional removal options, making them much easier for your opponent to destroy. If anything, I prefer Animist's +1, which both adds loyalty and draws a card, immediately fielding it if it's a land. What do you think of Chandra Bold Pyromancer in Magic: The Gathering? I haven't had much time to test her, but at a glance she seems better than most of her other planeswalker variants. Six mana can be costly, but that +1 loyalty of two extra red mana and a free two damage is hard to overlook.